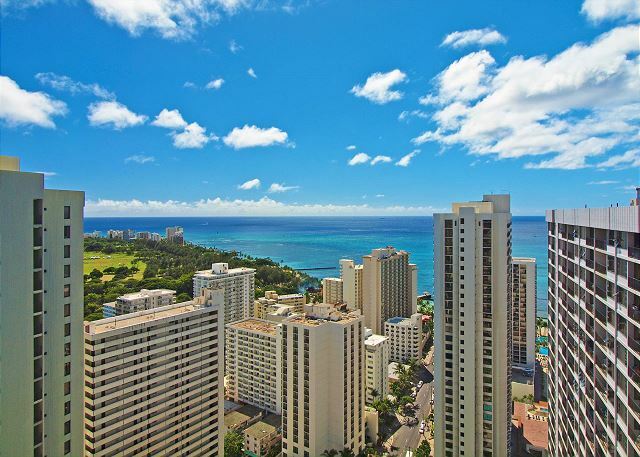 Waikiki Banyan #3810-T2 - Sweeping ocean views from penthouse-level one-bedroom with AC! Sleeps 4. This 38th-floor penthouse-level monthly rental boasts spectacular sweeping ocean views! 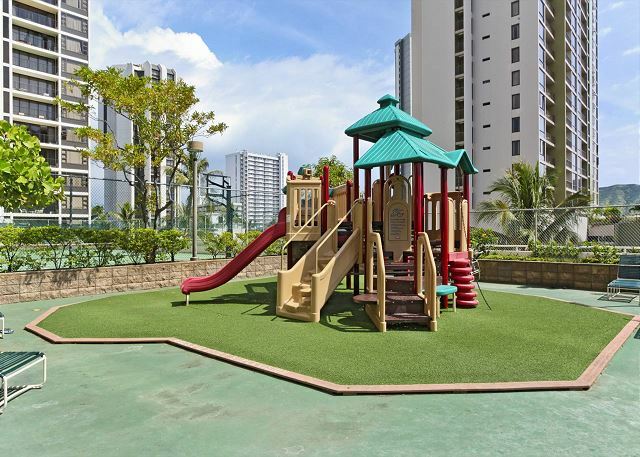 This air-conditioned condo in the family-friendly Waikiki Banyan, is 543 sqft (plus lanai with table and chairs). 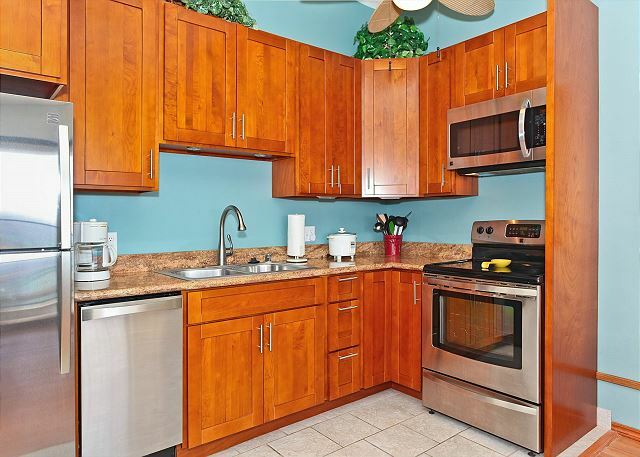 a great location and our condo was exceptional!! Captain Cook Resorts made our vacation hassle free. Aloha and mahalo for taking the time to post a 5 star review and recommendation of this fabulous condo. We're delighted you enjoyed your stay! It makes our day to know our dedicated staff was able to make your vacation from start to finish a wonderful experience. We look forward to welcoming you back to Paradise in the near future. Our 2018 holiday in Waikiki began with a breathtaking view of the ocean from our very comfortable unit 3810. 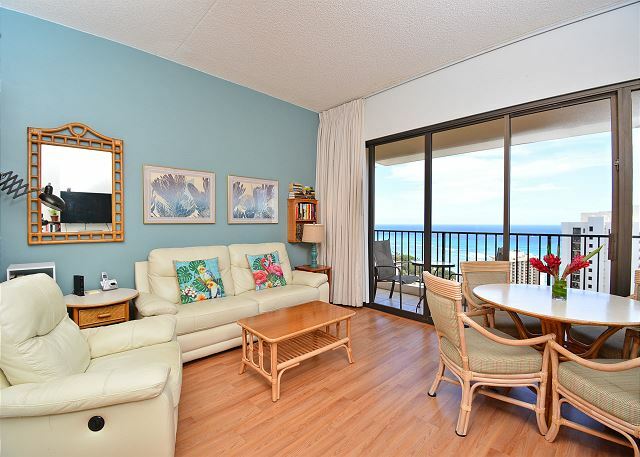 We are familiar with Waikiki Banyan and unit 3810 exceeded our expectations. Hopefully, we’ll be baaack! Mahalo, for the lovely 5 star review! 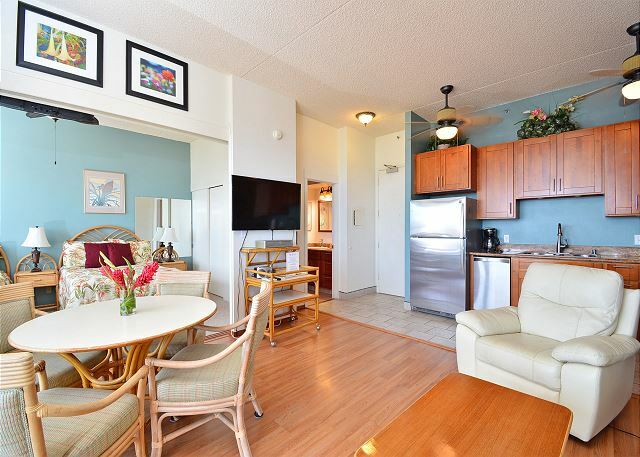 We're delighted you enjoyed your Hawaiian Christmas in this fabulous condo! It makes our day to hear we exceeded your expectations! Mahalo for choosing to stay with Captain Cook Resorts and we hope to see you soon on your next visit to paradise! The view from lanai was great and it was happy everytime when we wake up we can see really blue and emerald color which make us relaxed so much. As we visited Maui, Hawaii islands last year, we enjoyed domestic culture such as Blue Note and traditional dance ceremony. Moreover, International Market Place is newly open this year near to our condominium so that we visited many time for shopping and eating at nice restaurant in addition to Aramoana shopping center and food center. It was a great time indeed. 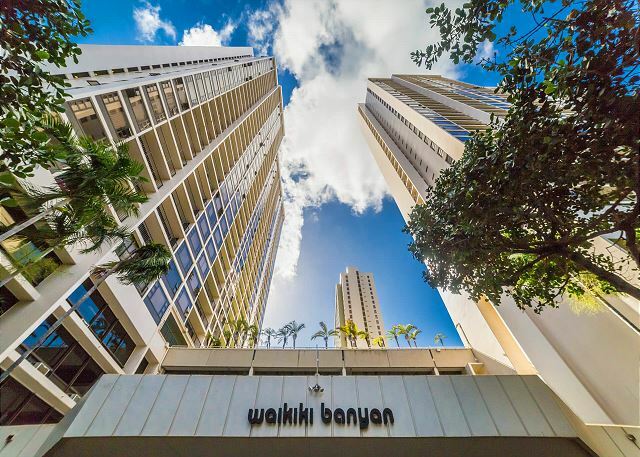 Mahalo for staying with Captain Cook Resorts and Waikiki Banyan #3810-T2, during your recent visit to Oahu. We are so glad you had a relaxing and memorable vacation and we look forward to your next visit!. This unit has all that you'll need to live comfortably as you would in your own home.The panoramic view of the ocean is the cherry on your cake. Byron, our property manager was very helpful and accommodating. Despite his efforts it took 2 weeks to have our bathroom vent unit fixed by professional electrician. Our only disappointment was the fact that the AC unit has not been properly took us about 30 minutes to clean both the grill and the filter, since my husband is allergic to dust. Overall we've enjoyed our stay and would recommend Captain Cook Resort services to anyone looking for a clean and comfortable accommodation on this beautiful island. Mahalo, Cenek for sharing your comments about your recent stay. We are sorry to hear that you felt the need to clean the AC grill and filter. Had you notified us immediately, we would have had Housekeeping to the unit right away to make sure everything was cleaned to your standards. In the future, please remember that the property manager is there to resolve any issues that may arise during your stay. We are pleased that you appreciated the ocean views of this beautiful condo and we look forward to seeing you on your next visit! We had a nice stay at Waikiki banyan!!! So great to hear you enjoyed your month at Waikiki Banyan! Mahalo! Beautiful ocean views. Exactly as the pictures show. Everything you need to enjoy your vacation is right here. Mahalo, Howie & Wendy! We're happy to hear you enjoyed your month-long stay with us! Hope you can return soon! We had a wonderful time in the Banyan. The new bathroom is terrific and a welcome improvement. Mahalo, Marcus! We're glad you enjoyed your stay and the improvements the owner has made to the property! This was my second time staying in this unit and will be doing so again. It has just had a new bathroom and carpet installed to update the unit which has always been kept spotless and well maintained. The view is awesome. Thank you for another month of living in paradise. Aloha and mahalo for the wonderful review and continued patronage! We're so glad you like the improvements made in the condo and look forward to your next visit! Rental experience was great as usual. Could use some cookie sheets for baking and some smaller glasses but we managed fine. We enjoy every time we go. It feels like home. Aloha and mahalo for sharing your comments about your recent stay! Next time you need kitchen items, be sure to let your property manager know! We look forward to your next stay! A wonderful experience of beautiful Waikiki. 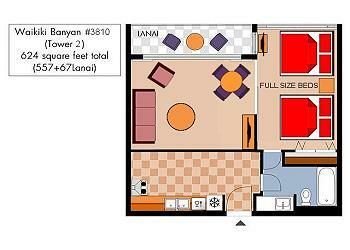 The apartment is in good condition with a new kitchen. We had some trouble with the WC not working well, but we were able to overcome that ourselves. It is really a delightful place. I stayed in the same unit three years ago and since then the kitchen has been upgraded and is very nice. There's a little more that could be done to improve the unit, but overall it is fine. This unit was upgraded from last yer, and we were pleased. A few more touches and it will be exceptional. The management company is first rate and very cooperative. WE highly recommed Captain Cook to all our friends. Des vacances magnifiques que nous n'oublierons jamais. The property is wonderful, but it probably needs a little updating - and the a/c needs replacing. Still, it is in a wonderful location and we have had a terrific holiday. Paul looked after us in a very professional manner. We were very comfortable in this condo. It was nice and quiet. Since my husband was recuperating from his heart attack on Jan. 5th, it was the perfect place to call "home" to recuperate. We met a lot of nice people everywhere. Sanderson. We recommend them both. We were unable to use this condo due to my wife's medical condition. We had booked for 3 months. Sizanne McGill has been extremely helpful to us when we had to cancel. WE definately will deal with Captain Cook again. Many thanks. Paul the person we dealt with is exceptional. He is willing to help in any way. Suzanne in the office is also very helpful. We find it uncomfortable not being able to get help from the front desk. They are polite but still uncomfortable. The banyon is impeccable in their maintenance and Captain Cook, with Paul as the trouble shooter, is first rate. The unit needs an update, and the air conditioner leaked, so we had to stop using it. The pots and pans are minimal, but again Paul came to the rescue, as i enjoy cooking. The kitchen needs a shelf to have some preparation room. I woould sugest a dishwasher, as many of the units have one. We are not returning to that unit,and we have booked another unit with Captain Cook for the same time next year. If the owners updated< which they should consider, we would as we love the buiilding, and the view. We very much respect and appreciate all of Paul's help. He is a first rate employee, as too is Suzanne. We thank our guest for their comments, We have addressedi the aircondtioner leak. As far as updating, the owners are doing a little at a time, with the addition of new dining chairs this fall and new headboards and bedroom dressers have been on order for several months now. Our guests liked to cook so we brought in more baking pans etc. for their use. As far as we know the building is not plumbed for dishwasher or washer/dryers in the condos.